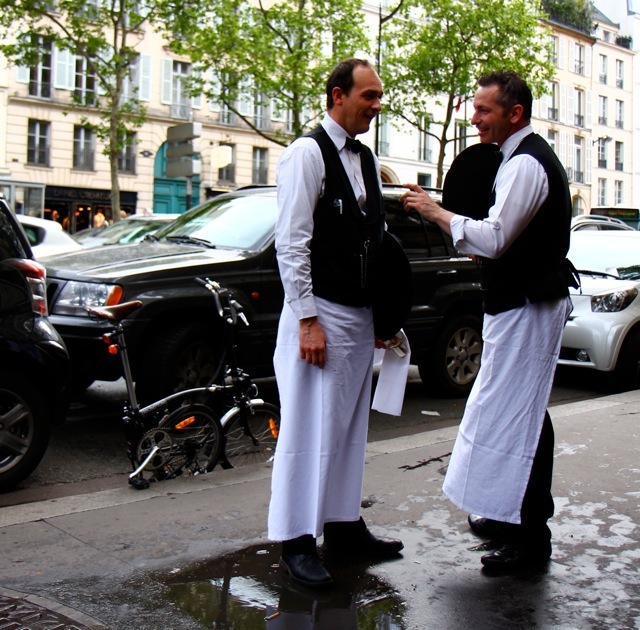 Hanging at the Café Flore, I spotted these dapper gents, wearing their formal garb on the streets. You don’t often see waiters just strolling the streets of Paris, because they change at the office. Cafés have underground lockers and these guys change just below you feet as you saunter on by. When they’re not at work, they blend in with the crowd, sporting unremarkable civilian wear. These penguins were cooling it on their break. A week later, I spotted them again, this time having infinitely more fun, oggling the ladies as the pass. 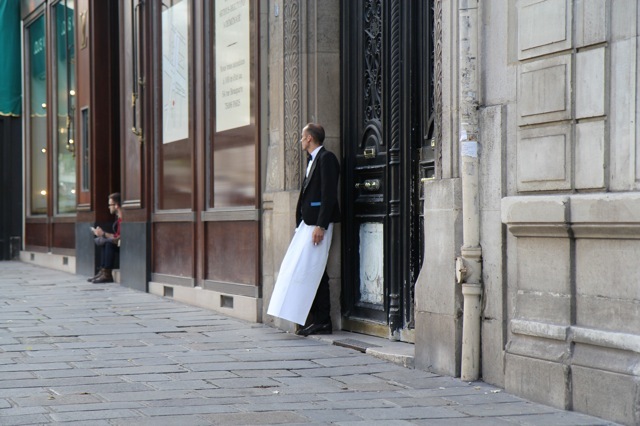 I’m not sure if this garçon* went back to serving after the lovely lady in red came his way, or if he had to got to the medecin de travail for whip lash! Or calling their damsel in distress, dealing with family matters, making medical appointments, placing bets at the races, and doing just about everything else regular folk do from the office. Only they do it on their feet, with a potential crowd and cars zooming by. It is a lot of work, requiring balance, diplomacy, a fairly decent memory. and some considerable math skills. Watching the tables and joking around helps them get through the day with their good humour and sanity in tact. 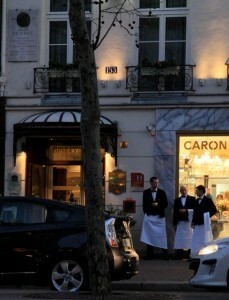 And even on their break, these quintessential Parisian gentlemen are happy to give passers by the time of day. *garçon – by now pretty much the entire planet knows not to use the term garçon, although I have noticed that certain Québecois visitors find it rather amusing and use the term as a joke, which always fails to make the waiters laugh. 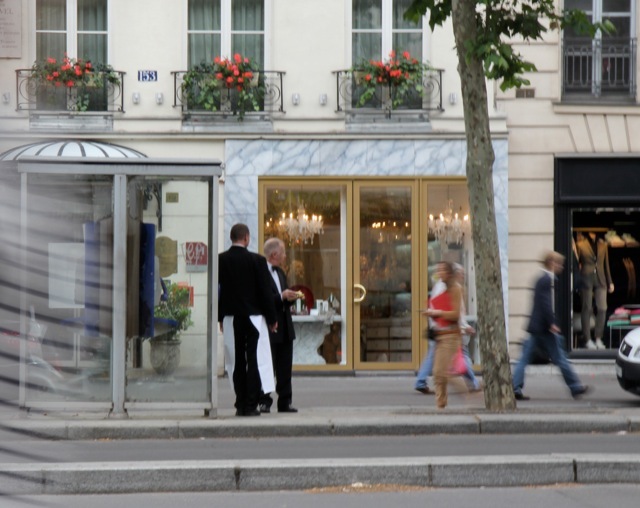 I am new to my ‘hood and when you’re new in Paris, it takes some time before the locals acknowledge your existence. Especially if you have an accent and they assume that you’re just another visitor who is staying in town for a month before heading back to the ranch. I have learned some tricks, like informing the butcher that I have a Mr French who is genuinely French and an ex-rugby man and he really would not appreciate it if I told him that the butcher had talked me into a noble pheasant (50€) for my humble coq (12€) au vin. Or informing the wine merchant that despite my accent, I had enough common sense to know that you don’t use a Premier Cru Classé as a cooking wine. At the cafés I sit at the bar and chat up the staff, sharing jokes and trying to be charming, so that they’ll remember me the next time I stop by. I was doing well at the café downstairs, having bonded with the owner over Les Landes, where we both spend our summer holidays. This morning the bar woman and I progressed from vacation chatter to weight issues and were laughing heartily as we bantered about this summer’s beach fashions while I completed a sudoku in Le Parisien newspaper. I was making a friend and I was starting to feel pretty cool when the owner stomped up from behind me, mumbling something about annoying patrons who hoard the papers to do games, as he swiped the broadsheet from under my pen! I turned to look at him in utter shock. 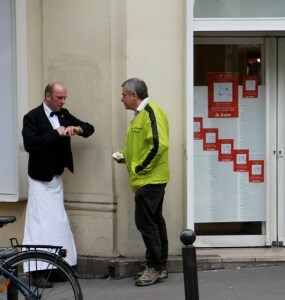 He saw my face and was immediately embarrassed (at least now I know he recognizes me), and started back pedaling, explaining that a patron on the terrasse wanted to actually read the paper and he’d return it in 3 minutes. He opened some People-like rag and shoved a crossword puzzle under my nose. Great, French crosswords for celebrity stalkers, just my kind of thing. I threw my coins on the counter and stalked out of the café curious to see who had trumped me. 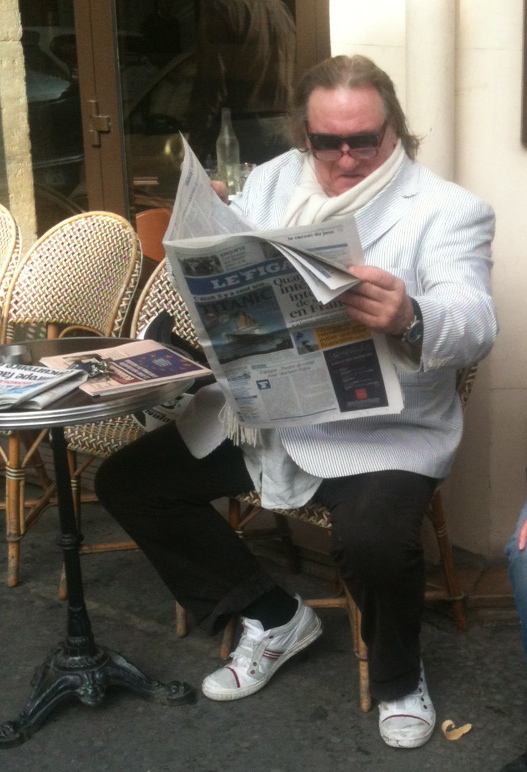 Gerard Depardieu!!! 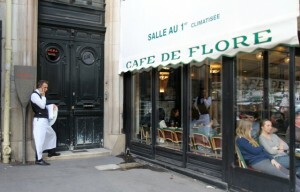 There he was sitting on the terrasse of my local café with my newspaper perched on his table. He wasn’t even reading it! “Hey, you’ve deprived me of my sudoku!” I scolded, laughingly. He looked up, unaccustomed to being yelled at by strange women with a funny accent, then joined in my laughter, offering to let me finish my game. “Non, non, enjoy” I replied, as I whipped out the iPhone and stole his soul. A theft for a theft, as Hammurabi would say.